Filial responsibility laws date back to 17th century English law requiring children to financially support their parents when they couldn't support themselves. Because of age, or maybe an illness like Alzheimer's, millions of Americans are no longer able to take care of themselves. Spending one's own money for care can wipe out a life's savings in a short time. It could be someone in your family. What happens when the money runs out? Out of love, you may feel a moral obligation to help. In some states, however, you may be legally responsible for paying your parents' long-term care. 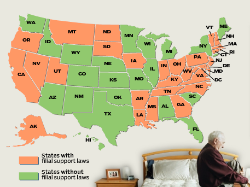 These are states with filial laws and long term care insurance will provide some protection for you and your family with Partnership asset protection. To care for her ailing 97-year-old father over the past three years, Elizabeth Rodriguez, a vice president at the Federal Reserve Bank in New York, has borrowed against her 401(k) retirement plan, sold her house on Staten Island and depleted nearly 20 years of savings. The money has gone to lawyers’ fees ($50,000) to win a contested guardianship. It has gone for home-care equipment like the mattress for his hospital bed (about $3,000 in all) and for a food service to deliver meals ($400 a month). It has gone for a two-bedroom rental apartment big enough for herself, her dad and a home aide ($1,600 a month more than a one-bedroom apartment in the same building), and for a wheelchair-accessible van to get him to doctors’ appointments ($330 a trip). The majority of home care is provided by unpaid family members. Some long term care insurance companies offer a "cash" option that would allow the policyowner to pay a family member or friend for care. Ask us about these plans. With experience of over 25 years in long term care planning our experts work with the largest and most financially secure insurance companies to make sure your future is protected. Get started protecting your future with an insurance quote.